December 2015 Yard of the Month! Wow! 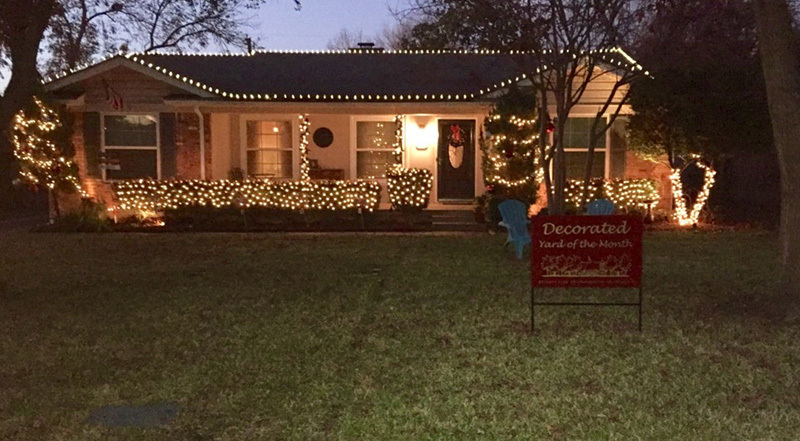 When we heard that we had been voted as the December Decorated Yard of the Month, we were ecstatic! My sister, Ashlee and I grew up in Richardson and love it here. When it came time to start looking at buying a house, there was no question that we needed to be in Heights Park! We love this neighborhood and all that it has to offer… and we often refer to it as “the bubble”. Ashlee and I love Christmas and we count down the days to Thanksgiving… not for the turkey, dressing & cranberry sauce….but that it means continuous Christmas music plays on our favorite radio stations, Christmas trees (yes we have two of them in our tiny 1,500 square foot house) and outdoor lights go up! We always go with the traditional white lights and love them! We’ve added bits and pieces each year including candy canes and perfect ornaments to go on the two juniper trees. We love our décor and the only thing that could make it better would be… getting rid of all those dang leaves! Thank you again for this honor and thank you to the Heights Park Neighborhood Association for your support of “the bubble”. Each year we see more and more houses that decorate and love walking around our little neighborhood to see the lights. We truly have the greatest neighborhood and we wish all of you a very Happy Holidays!